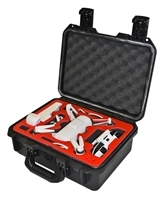 The Drone Hangar product line was created to answer the demand for high quality cases to protect all types of drones from shipping damage and rough environments. Used by professional photographers and Drone enthusiasts, our cases offer the ultimate protection. Drawing upon our vast experience in providing ruggedized shipping cases for Military and Commercial Unmanned Vehicles, we have created a product line that provides you with the best protection available. Our Pelican and Pelican Storm cases are all watertight and have water jet cut foam interiors that have all been designed by a Packaging Engineer. Take one look at our cases and you will notice that we use only the highest grade materials.